Gaspare DeLama flying saucer photos near Milan were printed in Domenica del Corriere in April 1962. Painter Gaspare de Lama is one of the most important witnesses and protagonists of the â€œFriendshipâ€ case, a true case of contact between humans and aliens that occurred in Italy between the second half of the 1950s and the 1970s. This interview was done in May 2010 by journalist and researcher Ivan Ceci, in his home at Mandello del Lario on the shores of Lake Como, Italy. IC – When were you involved for the first time with the Friendship [Amicizia] case? GL – It started in 1960, between 1960 and 1961, in a very banal way, because I saw pictures made by [Bruno] Ghibaudi on a weekly magazine called â€œSettimana â€¦â€ about 3 flying objects that appeared on the coast of Pescara [Italy]. One was very strange, the picture was very nice and I thought that it could be real, because one object was really peculiar, while the other two were classic saucer shaped. So I wrote to him (to the magazine) a few lines, congratulating him and adding something like â€œletâ€™s hope that those beings help us.â€ After 2-3 days, the time for the magazine to receive the letter, I received a phone call from Ghibaudi, telling me that my letter was chosen among the many they received (he was using the plural) and he asked for an appointment. He arrived in the evening – I had a group of friends, with whom I was sharing sightings information and field research, analysing the different cases, selecting hoaxes, from real ones – and I invited this group, too. He told about the things directly, without mentioning names (like Bruno Sammaciccia), he told about W56, the bases, everything, and we were a little surprised. Then at the end of the evening, while we were going down the stairs, someone said: â€œthere will be very few left of those ones,â€ and in fact only one remained of that group, Paolo Torre, and all the others left. And after a couple of times that I have seen Ghibaudi, one evening he arrived with Bruno, and then my story began. I started to know a little more, the phenomena,â€¦ it lasted for 5 years. Bruno was a charismatic man, fascinating, with culture, he could speak very well, a passionate man, from the south. It was difficult to say â€œnoâ€ to him, he was leading me slowly, nicely, through the events, the phenomena, I owe everything to Bruno. I still feel him in my heart, even if in the end he was tired, stressed. This story made 2 people go crazy, itâ€™s not an easy story. I also had some difficulty in dealing with it, one needs to be really balanced. The other world: we donâ€™t know it, but we would like to be there. This world here: it is too unbearable, and so you live somehow in between, but after a while you get used to it and you manage it. Humans, who have a normal nerves system, can get used to everything. I imagine that the ones, who had experiences even deeper than mine, had some stress, and Bruno also had a responsibility. IC – Film reels of movies? GL – Yes, movies that we then would watch or audio reels, with sometimes a greeting or sometimes some direction of things to do. Then there were those control nuclei of the apartment, there were blue lightning, 2-3 metres long, with a diameter of 20-30 centimeters, light blue, they would pop close to us without hitting us, they were renewing the nuclei of the apartment. Once every 20 days or so we would see those phenomena, because the nuclei needed to be renewed (updated?). Then Bruno asked me to buy a little radio, he put it on the table and after 2-3 minutes a blue flame came out of it, half meter high and he then said â€œok now it is readyâ€ and I always carried it with me. Sometimes â€œSIGIRâ€ (a [ET] member of the friendship case) or other members would speak through it. It would switch on by it self, Bruno would tell me to change the radio frequencies and I would change them, but the voices would still be there. I even tried to put another radio close to it, tuned on Milan, both radios were tuned on Milan, but suddenly mine would switch into the voice of Sigir, while the other was still tuned on Milan. Then, one day, Bruno told me â€œthey want to give you a present,” choose a place. So I have chosen a place close to Milan and we went there and we made a movie of the disc that I showed you before, and also photos, I then sent my photographic film to be developed and then we went home and we watched the movie. 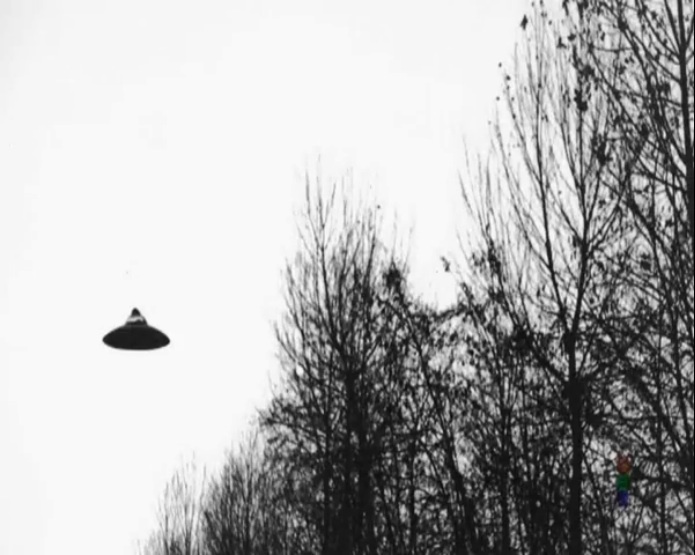 Gaspare took photos and film of this flying saucer sighting near Milan. More of Gaspare's photos available - click image. Then a lot of funny things happened, I remember that in 5 years I have seen 7-8 times other discs after a call for an appointment, also small, bright, in the night, in the sky. One was moving in a particular way (he shows with his hands in minute 9:12) doing like a theater, an exhibition, I saw many things. IC – Did you have a direct encounter with one of the W56? GL â€“ No, I didnâ€™t meet any, also because it was a dangerous time, they couldnâ€™t get out of their bases, they were about 3 meters tall, so it wasnâ€™t so easy, well some were smaller, but it wasnâ€™t safe to go out, only once they showed up on a hill, about 300 meters from the house of Bruno in Pescara, but I wasnâ€™t there (in the group we were about 10 people, there was a judge, an economist, a lawyer, â€¦-) and they saw them on that hill, saying hello. Bruno told us once that on that hill, that summer something would happen, and indeed it happened, they were there. They took pictures of them, there were some sea pines, and they were leaning towards these pines and were saying hello, I arrived just after that, and we went there afterwards to take measurements, and we measured that he was 4 meters tall. They took pictures of them and we all went to the photographer to develop the roll of film. Once there was also my wife, we were at Brunoâ€™s home, there was my little radio and we were 10-12 people and we were sitting randomly, and Sigir started to talk from the radio, he said hello to everyone, following the order of our position, he could probably see us. IC – How was he speaking, using a good Italian? GL â€“ Yes, good Italian, the Italian was perfect for all members, but Sigir, when he was greeting, he was saying â€œsaluto a tuttiâ€ (greetings to everyone) using an Abruzzo slang, and once I asked to Bruno â€œwhy does he say â€œsaluto a tuttiâ€ while the correct form is â€œsaluto tuttiâ€ and in that moment from the radio the voice of Sigir came immediately back and said : â€œGaspare! Saluto a tutti!â€. He wanted to make it clear that he greeted this way, because also Bruno was greeting this way. IC – They were imitating the dialect? GL â€“ Yes, they were imitating the dialect, and sometimes Dimpietro [an extraterrestrial] said â€œGaspare, change your thoughtsâ€ because I was thinking about something not really good. IC â€“ With which one of the W56 did you get on better? (did you enjoy more?) at least their voices. GL â€“ Sigir had a powerful voice, I liked Gallarate. GL – Because first of all, he was one of the youngest. We called him Gallarate, because the first time that he arrived on Earth he saw Gallarate [name of a town *translator note] and he said â€œhow beautiful is Gallarateâ€, so we called him with this name. And one day there was the transmission of a radio quiz between two towns, Gallarate and Frosinone, and Gallarate was rooting (supporting) for Gallarate. And we laughed and I liked him because he was a little different from the others, he was more similar to us. But I liked them all. Dimpietro did blame me twice, he was sweet but he was also very straight. IC – Why did he blame you? GL â€“ Because I was thinking about something that shouldnâ€™t be thought, I was thinking about nervous things. At the beginning, humans are doubtful, doubt is part of an intelligent mind, otherwise we would be too naive, you can have strong doubts that disturb you or you can have light doubts, that are only worries, but then, in the long term, from their voices and from their vibration, you become trustful. After all, the word â€œtrustâ€ exists, you can find it on the dictionary, so we should use it. At a certain point you have to trust someone. With doubt you can always question everything, endlessly, but trust came spontaneously. They make you feel it, itâ€™s like when you fell in love with your wife, it was enough her word of love and you trusted her, you didnâ€™t put her through a lie detector. You feel it. If we donâ€™t feel trust, itâ€™s our fault. You need more trust than faith, you could leave out faith, but trust is more important. Faith is too high, trust you can give it to a friend. Friendship is important, you can also not believe in God, but be â€œloveâ€. I know some atheists that are wonderful people. Trust is for me the most important thing. I think that the differences were caused by different ideologies, Bruno once explained to me. There are things that we donâ€™t know about them (life values, laws, ethic, technology, science) we can not understand their different intentions. To give me an example he said: â€œimagine a solar system that is disharmonic, that disturbs that side of the galaxy, well some civilisations, letâ€™s say the CTR [the W56 enemies *translator note] with their technology they can cancel it, destroy it and therefore improve the harmony of that side of the galaxy. The W56, would do different, in their ideology they think that if nature has created this solar system, one can try to reduce the damage respecting the nature of things.â€ Of course the CTR would destroy the planet only if it was not inhabited, but they would interfere anyway on the nature of cosmos, while W56 would respect it, even if it disturbs. This is a principle that develops also on ethics, on values. This doesnâ€™t mean that CTR are bad, if they didnâ€™t destroy their own civilisation it means that they love each others, they love their wives, their pets, but they have ideologies that are cooler and straight, science could be their God. While for the W56, God is Love. IC â€“ Why do you think that those beings, that are so evolved, needed your logistic help? GL â€“ Yes, they needed water, for us it was a minor effort, Bruno went to a friend who had barrels, he borrowed them, we filled them with tap water, we hired a van and we drove up there. Sometimes they would ask other material, rarely, 4 times in 5 years, it happened that you were asked for some material, and Bruno would organize it. But I have a personal idea about this, I could be also wrong, but this is my idea: since they needed Uredda (love energy) to survive, they needed a certain quantity of it (if we want to put it in market words) but we didnâ€™t give it to them, because, we were not in harmony between us. Let’s say, I donâ€™t give you love, I donâ€™t give you friendship and so you jump in a river and, even if you can swim, you shout â€œhelpâ€ to see if I give you my hand. So I have to help you and I give you my hand and so you receive my â€œrate of ureddaâ€ (love energy) that you need. So this demands of material could be a game to indirectly ask for uredda, but this is my idea, I told it to [Stefano] Breccia and he listened to me and said â€œit could really be like thisâ€. IC â€“ Do you think that they have definitely left the planet, after 1978, after their defeat? GL â€“ Well, I left in 1965, so I didnâ€™t live the last events, I hope not. I think not, because if they have this duty in regard to planet earth, they shouldnâ€™t be stopped by the failure of 10 run-down people. I think, I hope that they are still around. They certainly are still around, but we as a group, on the uredda (love energy) aspect, we failed. We are not here doing heroics, saying â€œvictory, victoryâ€, no, no, we failed, which is worse. IC – What did the W56 give you spiritually speaking? How did they change your vision about life? GL â€“ They made me understand that a better world is not utopia, because they exist. We are what we are, we are getting worse, while knowing that they exist and that they live on a wonderful way, and they are wonderful, make you realise that it is not an utopia, so it is something, to live in a cosmos, where there are goals that we could access. Sometimes I was asking about God, once they answered me, â€œlook Gaspare, think that we are here like a military party, not like missionaryâ€. We then understood, me and my wife, that we were asking things to which they could not answer, because we would have understood them on our own, through our spiritual evolution, we met Osho and this also helped us. So I received a lot from their way of speaking, from their presence. IC â€“ Why, according to you, did the W56 project fail, if it failed? GL â€“ Well, WE failed. Because of that uredda (love energy) they called it uredda, it was an energy, like the one when there is a negative pole and a positive pole, quanta and tachyons, that uredda was the energy of love. A love that we should have shared between us in the group and toward them. Toward them it was easy, between the groupâ€¦we are what we are. After 5 years it was broken. So they needed this uredda, that they collected it in their instruments in the bases, defence devices or others, I donâ€™t know, and when they didnâ€™t receive this â€œfuelâ€ (lets call it like this) the thing ended. They had to go, but I think, and it seems so, that they knew it very well, but they had to make this experience. 1950s Human ETs Prepare Us for Golden Age — Videos, Documents!